Watch Harmon vs Clemson. He’s like Michael Thomas and Davante Adams to me: big body, sure hands, can win with physicality at the catch point and is also very nuanced in his routes. He’s one of those guys who looks unspectacular because he doesn’t have a single attrubite that leaps out but he’s a great WR. I am definitely scared but think MM might be able to bring people back. Gruden is a hype guy and Mayock is a hostage negotiator. I think it would be funny and entertaining sitting down with both and could work extremely well together. They are greater than the sum of their parts. I could not listen to Gruden's BS for more than a couple minutes and I think Mayock might be that type that lets you know that if you do not like it we have other options. Neither works well by itself. I could see Gruden telling a player you are great and amazing. A Gruden Grinder and Mayock with a smile on his face looking over at Gruden and telling him to stop blowing sunshine up said players skirt. On a side note we almost always have a player we know we are going to draft. A player where it just makes so much sense we have to do it. I know it is very early in the process but White is starting to pick up a lot of steam and I think he is already starting to separate himself as the #4 player. I have been reading random stuff today and I am starting to get that feeling. Without him doing something stupid I see him staying there and people will start comparing him to Patrick Willis if he runs a 4.5 or better at the combine. I do not think it is a bad comp but White will have to learn how to do a better job of shedding blocks. I will rewatch it but that’s the game I watched and he looked like Treadwell type I question his ability to separate in the pros. Pretty realistic and I like it Rolni! I can see why you've chosen the FAs you have and they make sense but I'm really hoping for Earl Thomas to be the glue that holds the back end together. I think he could be a catalyst as our other guys played pretty decently last year considering they had little to no help from the pass rush. You've upgraded the DL, LB core and secondary without going out on a limb with contracts so that's great. I'd probably spend a little less on LB to add a guy like Thomas but I can easily see us doing something like you have. 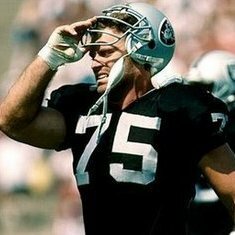 I can see Gruden spending a decent amount of draft capital on offence too as you have predicted which I think may upset some people expecting us to have a very defence heavy draft. I dislike Harmon but haven't watched him enough. I also prefer Dortch to Isabella. Otherwise, it looks very good. I think it's smart and safe. Mayock will follow this approach IMO. I'm fired up to have him.